The Papua New Guinea government will legislate to shield the Australian run asylum seeker centre on Manus Island from constitutional challenges, as both nations solidify their controversial border protection policy. PNG foreign minister Rimbink Pato told journalists on Tuesday the government of Peter O'Neill will introduce the legislation in September. He made the comments after signing a memorandum of understanding (MOU) on asylum seeker resettlement with Australian high commissioner Deborah Stokes. 'We are passing legislation, bringing amendments to provisions in our constitution, to ensure that the potential for any litigation is avoided or is otherwise eliminated all together,' Mr Pato said. PNG's opposition last week launched its second constitutional challenge against the centre, months after its first attempt was dismissed. In the MOU PNG has pledged not to send asylum seekers back to countries where their lives are endangered, in accordance with the UN Refugee convention. It also says Australia will bear all costs of the plan, and that equipment transfers between countries are tax exempt. Opposition spokesman Scott Morrison earlier told the ABC the deal with PNG wasn't real. 'They don't actually have a resettlement agreement in PNG, we know their Nauru announcement which they announced on the weekend also fell over,' he said. Australian Immigration Minister Tony Burke, who is in PNG, said there was a 256 hectare site on Manus Island that could be used for detention camps on top of other sites around the island. In the meantime, there is sufficient capacity at the already functioning site on Lorengau. Mr Pato said it was superficial to say PNG did not have the capacity to manage to deal. Mr Burke said information was already coming in from Indonesia that asylum seekers are demanding their money back from people smugglers. 'The illegal trade of people smuggling has run out of the product it used to sell,' he said. 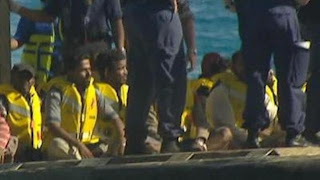 Since Australia and PNG announced the agreement two weeks ago 1800 asylum seekers have arrived in Australia by boat. Meanwhile another 39 asylum seekers have been flown to Manus, where they will join 66 others houses at the Lombrum site.